Kelly Chrestman, Ph.D., is a licensed clinical psychologist working as the lead for online consultation services at the Center for Deployment Psychology (CDP) at the Uniformed Services University of the Health Sciences in Bethesda, Maryland. 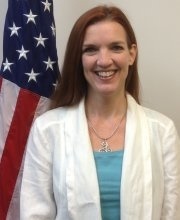 In this capacity, she is responsible for the development of the CDP’s web based consultation services to DoD and military mental health providers. Dr. Chrestman received her Bachelor of Arts degree from Rhodes College, Memphis, Tennessee and her Master of Arts and Doctor of Psychology degrees from Nova Southeastern University. She completed a clinical psychology internship at the University of Mississippi, Jackson VA Medical Center Consortium and postdoctoral training at the Women’s Health Sciences Division of the National Center for PTSD,Boston, Massachusetts. Prior to joining the CDP, she was a research scientist at Behavioral Tech Research, Inc. and a clinical psychologist at the Center for the Treatment and Study of Anxiety at the University of Pennsylvania. As a clinical and research psychologist, much of Dr. Chrestman’s work has focused on trauma, violence and anxiety. She is particularly interested in the dissemination of empirically supported treatments, and using technology to improve the accessibility of treatment and training in community settings. She has trained numerous student and mental health professionals from the United States and other countries in techniques for treating PTSD and other anxiety disorders. Financial: Kelly Chrestman is employed by Center for Deployment Psychology. Non-financial: Kelly Chrestman has no relevant non-financial relationships to disclose.